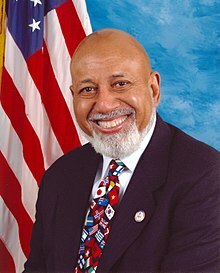 Alcee Lamar Hastings /ˈælsiː/ (born September 5, 1936) is an American politician and judge. He is the U.S. Representative for Florida's 20th congressional district serving since January 3, 1993. The district includes most of the majority-black precincts in and around Fort Lauderdale and West Palm Beach. He is a Democrat. Hastings served as a judge on the United States District Court for the Southern District of Florida until his impeachment and removal due to Hastings being involved in bribery-related actions. In January 2019, Hastings was diagnosed with pancreatic cancer. ↑ Senate Removes Hastings, The Washington Post, October 21, 1989. Retrieved March 14, 2012. ↑ "Rep. Alcee Hastings diagnosed with pancreatic cancer". The Washington Post. January 14, 2019. Retrieved January 14, 2019. Alcee Lamar Hastings at the Biographical Directory of Federal Judges, a public domain publication of the Federal Judicial Center.